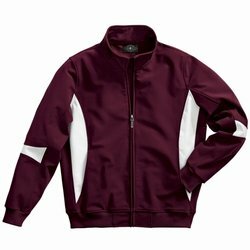 Wind and water-resistant soft shell polyester spandex bonded to tricot. Color block design on sides and arms. Rib knit cuffs, collar and hem. Side and inside valuables pocket.